Q. What is the timeline for breaching? A. To minimize any deleterious effects of resuspended sediment, breaching should occur when few migrating salmon are present (12/15 - 3/15). December 1 - Lower Granite draw-down begins by dropping 1/2 foot per day, increasing up to 1 foot per day. This is half the rate of the FR/EIS 2002 design so as to reduce railroad and roadway damages from the sluffing of saturated slopes. January 23 - Controlled hydraulic breach of Lower Granite. January 23 - Little Goose draw-down begins. March 15 - Controlled hydraulic breach of Little Goose. Two of Four LSR reservoirs have been drained. Rinse and Repeat in 2019/2020 at Lower Monumental and Ice Harbor. opening up to 87 miles of Fall Chinook spawning area. 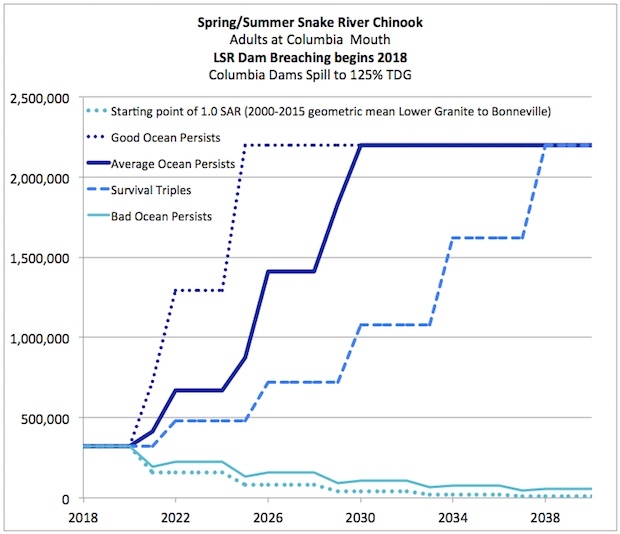 and survival rates are expected to at least TRIPLE (see Fish Passage Center's 2017 CSS Report).